WOLF TONES is an idea for a a sculptural sound installation that I plan to realise in the future. Wolf Tones is inspired by the sonic phenomenon that occurs in cellos when a note is played that matches the resonant frequency of the wooden body of the instrument. This induces a fluctuating, pulsing sonic interference which fights with itself by both accentuating and cancelling itself out. This is perceived as a failure in the instrument and cellists usually purchase a ‘wolf eliminator’. It is when the cello speaks with the resonance of its own body, the very sound that describes its physical structure, that the wolf tone occurs. 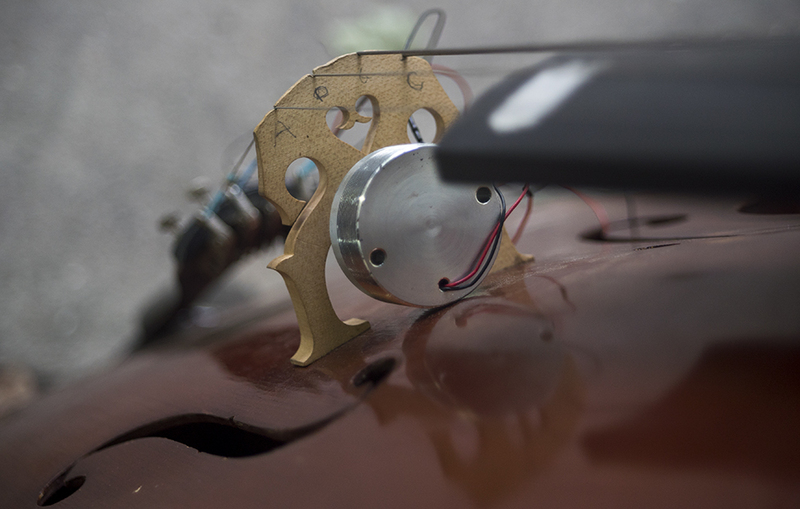 Wolf Tones sculptural sound installation will be created from salvaged, old cellos adapted with mechanical devices and transducers that resonate their strings and bodies. Feedback loops will generate pulsing tones based on each cello’s wolf tone and its related harmonics. The cellos will work in relation to each other and form a networked, automated ensemble. The soundworld will span from quiet sounds, on the edge of ‘speaking’ to multi-layered pulsing wolf tone drones. The wolf tone is an accidental phenomena that is usually suppressed. This artwork embraces the accident of the wolf tone and employs chance by using machines that search for wolf tones on each cello. As one cello discovers a wolf tone, it induces wolf tones in the other instruments through a network of feedback loops. This builds into layered, pulsing drones until the wolf tone is lost, only to be re-discovered by a different cello which sets the cycle off again. Wolf Tones installation becomes the setting for a series of live performances and interventions by multiple cellists. 22 October, 2016 | Filed under News and tagged with audio-visual, cello, composition, installation, music, performance, sound-machine.